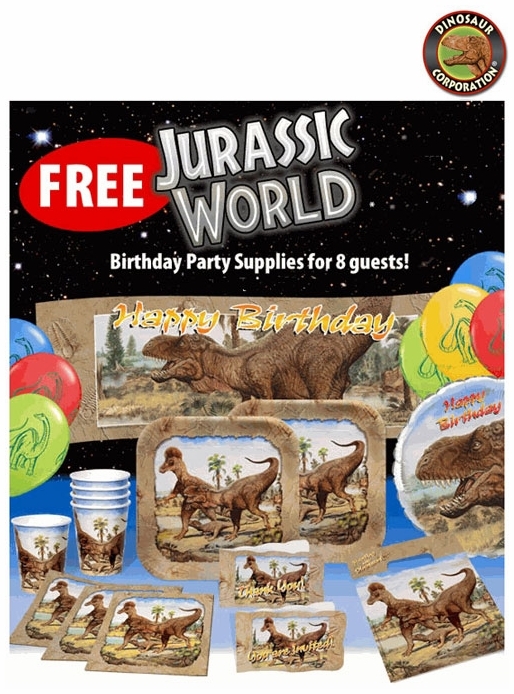 Jurassic World Deluxe T-REX Exclusive Party Supplies. The realistic prehistoric design is featuring the most famous predator Tyranosaurus rex from Jurassic World. Kids friendly prehistoric dinosaurs Brachiosaurus, Triceratops, Stegosaurus and Stegosaurus are on the T-rex Happy Birthday PHOTO Banner. Also great design for Dino Dig party showing on tableware prehistoric fossils from 500 million years ago. * 6 Decorative Metallic Colored Latex Balloons 12"
1 Jurassic World Deluxe T-rex Exclusive Tableware for 8 Guests with $99 order+.